Remarkable teamwork creates outstanding results, and that is the success of Hayden Design. As the leaders of the team, Donna Hayden Keene and Linda Thorup have combined their unique talents and personalities to become one of the most trusted and accomplished independent design firms in N.C.
Creativity is enhanced and solutions become more robust when ideas are developed by a team of engaged experts, who can visualize your space and envision your future possibilities. The Hayden Design team members are pros at staging and managing all the details of complex projects. The Hayden team will bring your ideas, your brand, your needs and requirements, as well as your budget together into a finished product—one that you could only imagine and that is uniquely yours. 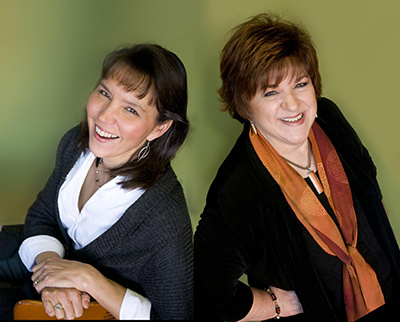 Donna and Linda always want their clients to not only to be pleased with the end results of their work together, but also to enjoy the entire process. Their clients appreciate being full members of the project team which often includes architects, contractors, developers, facilities’ staff, and others. The many long-term relationships Hayden Design has developed with companies large and small since the business started in 1981, attest to the passion this team brings to its work. Hayden Design is recognized for bringing a fresh approach including: the newest products, the latest research, and an understanding of current trends to all their projects, while always reflecting the culture and philosophy of their clients. "Renovating or relocating can be disruptive and stressful for organizations. We're committed to making the process a positive experience for our clients. We manage every detail of projects so that they can continue doing their work, without unnecessary distractions."